Summer is coming to a close, but I am hoping we'll have nice weather for a while yet, so that I can continue shooting at the beach. 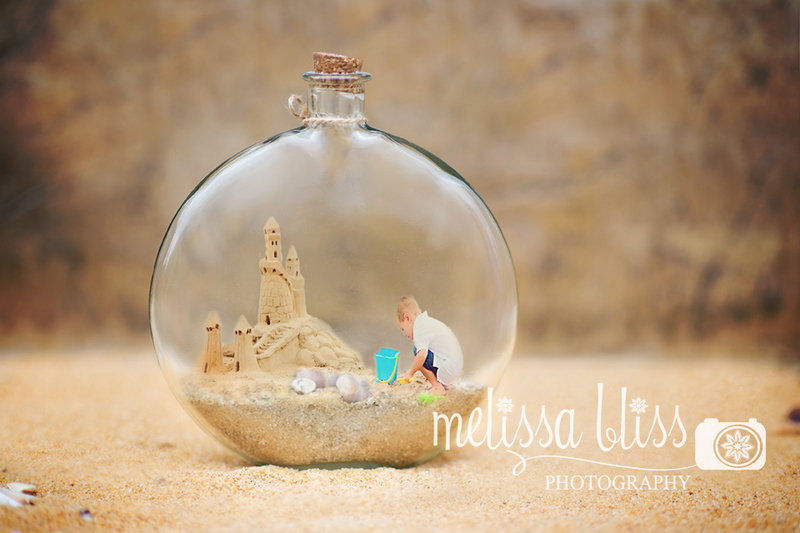 I love shooting sessions on the beach and this summer I have had several. The wide open space, soft colors and fun opportunities for creative compositions are a great recipe for interesting portraits. During a session last week, I was even lucky enough to stumble upon this fantastic sand castle someone had built and left along the shore. When I saw the summer and sand template on the Colorvale site, I knew it was a match made in Heaven. I added a portion of my image to the globe and this is the result. The globe template is currently on sale for $7 in the Colorvale online store, but I have one to give away* to a lucky reader! The template works in Photoshop and Elements and a tutorial for use is listed on the site if you need help. *This giveaway is sponsored by Melissa Bliss Photography & Serendipity is Sweet. Thanks for visiting! Well isn't that clever- I'm so very happy to see your business growing. What a blessing. Hugs! !